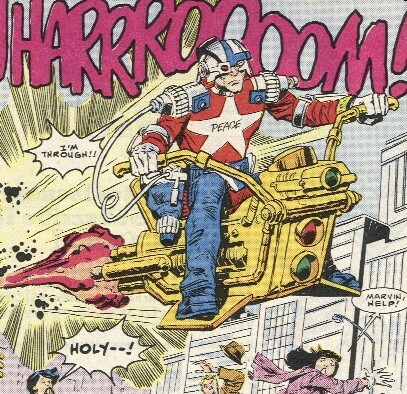 Powers/Abilities: He rides a Hopsikle, which can be charged with temporal energy to allow him to travel through time. When the charge runs out, he will be pulled back to the TVA's Null-Time Zone or to his native timeline. He wears a force field device known as an energy-enhanced union skin, which allows him to withstand a punch from Thor. His helmet can analyze iris distension and crosscheck visual purple light wavelength to analyze the truth from others. He wields a Peacemaker, which can fire a number of devices, including: DNA implants that prevent their target from ever committing a certain crime again; napalm-like charges; heavy-density plasma that congeals into a restraining device; etc. He is exceptionally quick of reflex and is a skilled marksman. He is also genetically incapable of both humor and lying. (Thor I#372(fb)) - At some point in the future in an alternate timeline, Justice Peace served in the Federal Police in Brooklynopolis (the USA of that timeline). In that timeline, genetic encrypting at birth kept ordinary crimes to a minimum. During World War VII, the mayor of Brooklynopolis was concluding the ceremonies linking the old Panama Canal with Crater Lake in Patagonia when she was murdered by the diplomat from the Greater Tashkent Protectorate. Unaccustomed to such violence, nations responded severely, launching nuclear missiles across the planet. Fellow Federal Policeman Justice Mills shot and killed the diplomat, releasing the dozens of creatures contained within his host body. Further research revealed the killer to be the Zaniac, and they traced the Zaniac's history back, possibly linking him to Jack the Ripper. However, they did find more definite traces back to the modern era. Special Services contacted the Time Variance Authority (TVA), who agreed to send him back to take care of Zaniac once and for all. (Thor I#371) - Justice Peace arrived in the modern era of Earth-616. Seeing a group of jaywalkers, he used his Peacemaker to inject them with DNA implants that prevented them from ever jaywalking again. His actions were mistaken for assaults by Thor, who attacked him in turn. After a short struggle, Peace put a swift end to things by snaring Thor in one of his restraining devices. However, the delay had proved to be too much and the Zaniac had killed a woman, Ruby, and then transferred to a new host, from Brad Wolfe to Thug Thatcher. (Thor I#372) - Justice Peace arrived to find the corpses of Ruby and Wolfe. Thor arrived minutes later and, mistaking Peace's intentions, fought Peace again. Peace eventually ascertained Thor's status as a hero and then explained his purpose. Thor came upon the idea of traveling back in time and preventing the deaths, but Peace's Hopsikle lacked the charge. Thor used the residual chronal energy in Mjolnir to amplify the charge of the Hopsikle and they arrived in time to stop the Zaniac vermin from transferring to Thatcher, instead destroying all the vermin. However, Ruby was still dead, and Thatcher had had a heart attack from the stress. Justice Peace then returned to his own era, just as his past self was arriving. (Fantastic Four I#352 (fb) - BTS) - Justice Peace was hired as a freelance agent of the TVA. (Fantastic Four I#352) - TVA manager Mobius (or one of his clones) sent Justice Peace and a squadron of Minute Men to Earth-616 to stop Dr. Doom and Reed Richards from using their Time Sequencers in a battle. When Doom destroyed some Minute Men, Peace blasted and apparently slew Doom, and then he convinced the Fantastic Four to peacefully accompany him to appear before the new Committee on Time Lapses and Synchronicity. 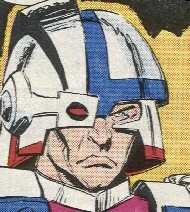 When questioned why he couldn't have just traveled back in time and disarmed Doom without killing him, he explained that: (1) If he had done so, Doom would not have been guilty of a capital crime and so Peace could not have legally executed him and (2) He didn't want to mess up the timestream any further by doing so. However, after he left--apparently unbeknownst to Peace--the real Doom then appeared, having replaced himself with Kristoff Vernard during the battle with Richards, and it was Kristoff seemingly slain by Peace. However...Kristoff was also not really dead. (Fantastic Four I#353) - Peace arrived with the FF in the Null-Time Zone, approaching the TVA base over 2 minutes ahead of schedule. Frustrated by such a miscalculation, he took the long approach to arrive exactly on time. Peace led them before the Committee, whom he informed that Doom had been "degraded to nonfunctional status" while resisting arrest. Peace then stepped back and observed the proceedings. Later, when the FF escaped from their cell, Peace led some guards in their pursuit. (Fantastic Four I#354) - Justice Peace confronted Reed Richards while the latter was trying to introduce a virus to: (1) Start replicating the TVA timeline to produce so many divergences that the TVA wouldn't know which FF were the real ones, and (2) to erase all evidence of the Earth-616 timeline from the TVA records. Peace's motion sensors in his revised Hopsikle detected Reed and Sue despite their invisibility. When an armor-piercing shell failed to pierce Sue's force field, he unleashed a continuous stream of energy-dispersing pseudo-protons, which proved capable of dissolving her field faster than she could form it. However, Reed's virus took effect before Peace's blast could strike them, and it had the intended effects: The "true" Reed and Sue escaped Peace's notice in the ensuing chaos. Peace followed the FF as they proceeded to escape aboard Casey's Illinois Central Cannonball Express time train. He covered the Torch in a dense, flame retardant foam which pinned him to the ground. He blasted out the roof of the train under Ben's feet, taking him out of the struggle, but Sue used his force fields to disarm and then trap him. As a temporal wave (created by Reed's virus) approached them, Peace agreed to join forces with them to escape the wave, having found his time with the TVA distasteful anyway. He planned to return to his own timeline, and told the FF that they had broken no laws in his new jurisdiction. As the train passed his timeline, Peace leapt off, telling the FF to break no laws and they would have Peace no more. (Deathlok II#33(fb) - BTS) - Godwulf fought alongside Justice Peace during some unknown struggle at some point in the past. (Deathlok II#33(fb) - BTS) - The TVA sent Justice Peace to bring in Godwulf for his failure to apprehend the criminal Timestream. (Deathlok II#33) - In the timestream, Justice Peace and a squadron of the TVA Police Department appeared before Deathlok (Michael Collins), Godwulf, and Siege. The Police subdued Godwulf, and Peace snared Collins. The Police then prepared to scrap both Collins and Siege, but they both rallied and overpowered Peace and the Police. Godwulf then convinced Peace to allow he and his allies 24 hours to try to bring down Timestream. Peace directed them where to find Timestream and agreed to keep the Timecops off of their backs for the agreed duration. (Deathlok II#34) - In the timestream, Justice Peace appeared to Deathlok (Collins) after the Luther Manning of Earth-616 had committed suicide. He then explained what Timestream had done, and what he was seeking to do. He also explained how the TVA planned to use Timestream's alteration of the timelines as an excuse to permanently delete those realities. Having great compassion for the Earth-616 reality, as well as an old debt to repay Godwulf. He thus directed Collins, instructing him how and where he could find Timestream. However, he could not join him in actively opposing Timestream, as he knew that if the TVA learned of his intervention, his own reality would be obliterated. As he sent Collins off, Peace assured him that Manning would receive a proper burial in his native timeline. After Godwulf, Collins, and Deathlok the Demolisher defeated Timestream's plots, Peace arrived, detailing their full success and escorted them each back to their respective timelines. (Marvel Fanfare II#1 (fb) - BTS) - Peace encountered Captain America. The two did not part on friendly terms. (Marvel Fanfare II#1 (fb) - BTS) - The TVA sent Peace to Earth-616 to stop Deathlok the Demolisher from changing certain conditions within that timeline. (Marvel Fanfare II#1) - Peace confronted Captain America, informing him of the Demolisher's intent. Not wishing to slay Deathlok, Peace asked Cap to try to convince Deathlok to stop of his own will. As Cap attempted to do just this, he and Deathlok came to blows as Deathlok sought to finish his mission. 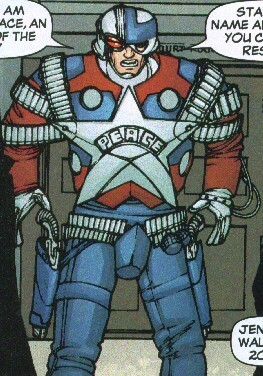 In mid-conflict, Peace reappeared announcing that Cap had stopped Deathlok's success sufficiently. Deathlok explained that the Red Skull was the force behind Nth Command's Operation: Purge (the event that had banished the heroes from his Earth, and the point of divergence between Earth-616 and Earth-Deathlok), and that he had come back to kill the Skull to prevent him from reinitiating the plot. Cap told him that the Red Skull was already dead in their reality (as of Captain America I#448, though, of course, he came back later). Peace felt that Deathlok's accumulated knowledge was dangerous and that he needed to be terminated as a safety measure. However, Cap and the Falcon instead convinced him to send the Demolisher back to his own timeline. (She-Hulk IV#1) - Justice Peace (alongside Justice Love) was summoned to act as bailiff in the trial of Charles Czarkowski, who had shot and killed a man who allegedly was going to kill him in the future. The jurors had been summoned from the past to avoid anyone who knew about his crimes. Peace had all involved sign a form stating that he or she would not pollute, corrupt, or alter the natural course of time in any way. (She-Hulk IV#2) - Justice Peace laid out the ground rules to the jurors and then he and Justice Love watched over the trial as it unfolded. In mid-trial, Peace detected I.C.E. (Illegal Chronal Entry), specifically a robot summoned from time by Czarkowski to facilitate his escape. Despite Peace and Love's efforts, Czarkowski did escape, and the judge declared a mistrial. Peace, however, tracked Czarkowski to his lair, just after Czarkowski had used a Scrambler to alter his appearance and then send a garbled message to the past which made it appear that his scrambled identity was confessing to the intent to murder his past self. Peace made Czarkowski follow through with his initial plan to complete the temporal loop, traveling into the past where his past self--seeing him as the would-be murderer--shot him, leaving him brain-dead. Peace then returned to Love, and the two confronted the She-Hulk, charging her with tampering with the trial by trying to warn the past Hawkeye of how he was to die during the Scarlet Witch's reality warp/"Disassembled." They transported her to the Null-Time Zone. (She-Hulk IV#3) - Peace and Love brought the She-Hulk to the Time Variance Authority's headquarters, passing through the time cells and then asking her to choose her counsel. Based on her request of having the best from her firm (Goodman, Lieber, Kurtzberg, and Holliway), they summoned Southpaw of Earth-6023, who instructed them to remove the She-Hulk's manacles. Peace acted as security in the subsequent trial, with Love acting as prosecutioner. After numerous witnesses had spoken in favor of the She-Hulk, Peace suggested that Love show She-Hulk what would happen if she won the trial. Love showed She-Hulk the future of Earth-6232, "the Reckoning War," which made the She-Hulk request the harshest punishment: erasure from time. However, as the Retro-Active Cannon was brought out, the temporal criminal Clockwise (having impersonated a Justice) usurped the weapon and turned it on the crowd, wiping out Dr. Rocket and Knight Man before Justice Love could render the other witnesses immune to its effects. Clockwise nonetheless wiped out Justice Goodwill and the judge Mr. Paradox (as well as another judge, Mr. Orobouros, a future clone of Paradox) before the She-Hulk stepped in the weapons past. Warning Clockwise that if she were wiped from time, the events that brought him to the TVA and allowed him to obtain the cannon would never have happened, She-Hulk distracted him long enough that she could punch him out. The She-Hulk rescinded her plea of being wiped from time, and the remaining judge, Mr. Mobius ultimately decided that she would instead be charged with choosing a prisoner from the time cells to watch over, so that a cell could be freed for Clockwise. Peace stood by Love as she returned all of the other time travelers to their own times and places. Comments: Created by Walt Simonson, Sal Buscema, and Albret Blevinson..
Time travel always makes for difficult continuity. FF#354 would seem as if it might be the end of Peace's association with the TVA, meaning it occurred last in his personal chronology. However, it's also possible that he just came to work for them again under unexplained circumstances, and his appearances have been completely linear. I'm not 100% convinced that the Deathlok the Demolisher in the Marvel Fanfare series was the exact same Demolisher seen in the Deathlok Timestream issues (and thus the same Demolisher as in all of his prior appearances). I'm guessing that he was meant to be the same, but that the writers just didn't go with his older, Demolisher appearance. Maybe it was meant to occur after the Captain America Godwulf/Hellinger issues, but before the Deathlok Timestream issues. I'll work on a Demolisher profile after I'm done with my current projects for Marvel to try to work this out. I don't have time to get into the other Justices (Liberty, Love, Might, and Truth) from Fantastic Four Annual#27 at this point. Peace did not appear in that issue. They might be clones, or just modeled after him. Or not. Justice Love is a woman, so probably not.